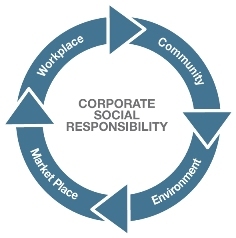 What is Corporate Social Responsobility or CSR? Corporate Social Responsibility, or CSR, is a type of self-regulation employed by companies where the company ensures they maintain compliance with ethical and legal issues. Oftentimes CSR goes further than just compliance and businesses will look to further a social issue. Environmental causes are commonly tied to CSR. Essentially, CSR is a method of embracing responsibility and encouraging a positive impact that reaches beyond the products or services provided. CSR is about more than the company doing the right thing. Companies strive to encourage their consumers, employees, communities, stakeholders and others to participate and emulate their actions to further help address social and environmental issues. Practicing Corporate Social Responsibility will help set your brand apart from your competition. It will make your company memorable and help your target demographic realize and appreciate what your brand is about. People are more apt to do business with a company that holds similar values and works towards the same goals, so not only can you expand your customer base and network, but you can also help further the social causes you support by rounding up more support and resources. Companies that practice CSR develop a loyal following amongst their customers. This faithful following is more likely to stick with the company and continue to purchase their products or services and support the brand even during economic downturns, which is good news for your bottom line. Building such a following is also a great social marketing tool – your customers will help drum up support on social media sites and sing your praises to their friends, family and coworkers as they expand your network. There are tons of ways to incorporate Corporate Social Responsibility into how your company conducts business. If you deal with heavy-duty cleaning solvents or other chemicals, research using low Volatile Organic Compounds (VOC) to take it easy on the environment. You can also look for ways to recycle as much as possible – start by making sure you have recycling bins for your staff to toss their empty water bottles and soup cans, but look for other opportunities to recycle, whether it be chemicals or byproducts. Take care to promote your brand in a socially responsible manner. Our recycled bags are a great opportunity to work CSR into your business plan. 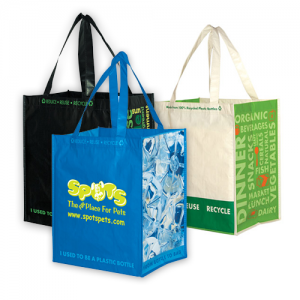 Constructed from recycled materials these durable bags are designed to deliver years of use while they increase your brand awareness, and they can also be recycled when the item has fulfilled its usefulness, minimizing your brand’s environmental impact. Implementing CSR is great, but you need to spread the word. Use your blog, reusable bags, and social media to explain what your company is doing to implement CSR into your routines. When possible post pictures to help your followers visualize what your brand is about. If you opt to market your brand with a reusable bag think about printing a message on the bag letting your customers know that you are serious about your goals and strive to do right by the environment, or whatever issues you choose to support. May sound simple, but it works.